Some friends from Portland, Maine flew in to do the Livestrong Challenge Austin bike ride last weekend. Team “Not Dead Yet” has flown down from Maine for the past few years, bikes in tow, spreading their brand of “Lobster Love” to central Texas. The team’s fundraising for the ride contributed towards the overall $2.4 million raised by the 4300 Livestrong Challenge Austin participants this year (2500 cyclists, plus 5K runners/walkers). It was cool to see that 100 percent of donations to the Livestrong Challenge Series go directly to support cancer programs and initiatives. It’s bizarre that half of the eight guys on this year’s “Not Dead Yet” team are cancer survivors. Too much cancer going around for all of us “young” folks. As we shared our cancer stories and Tex-Mex at their rented digs in South Austin (viva Polvos! ), I had a new appreciation for each of their unique cancer experiences, especially now that I am on the other side of my treatment, surgeries and have no evidence of disease. What a change from last year when I visited with them and was smack in the middle of chemotherapy! Team “Not Dead Yet” has been raising money for years through their bike ride in New Gloucester, Maine, benefiting the Cancer Community Center. This year’s “Fight Back Festival” series of events incorporated the bike ride, along with a run and walk, and raised more than $55,000 to support the Cancer Community Center’s free programs & services. Kudos to the team for helping out their local community! 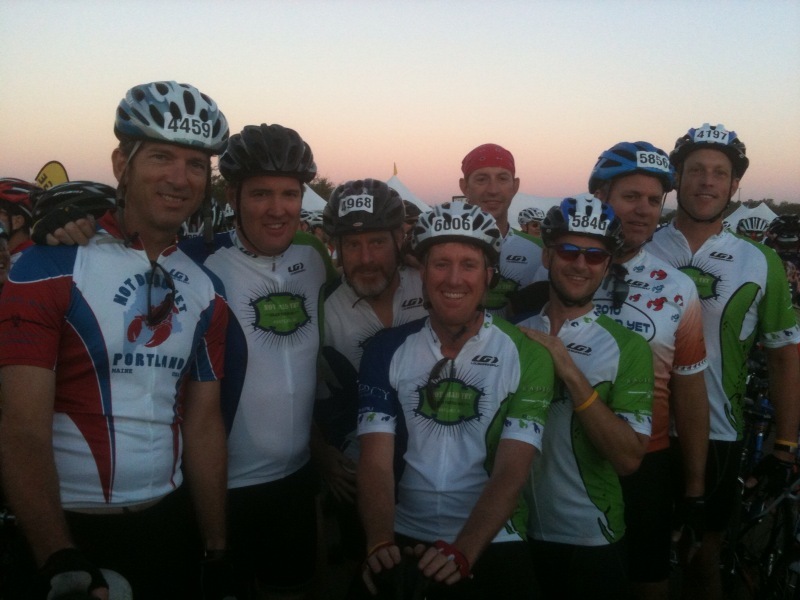 I’m looking forward to seeing these guys at next year’s Livestrong Challenge Austin. Who knows, maybe I’ll be strong enough to ride along!